Defiance mill was built by Samuel Henshaw in 1800 and is believed to be the oldest remaining mill structure in Bollington. By 1806 Stephen and John Sheldon owned it until the mid 19thC. They are thought to have been spinning cotton. At some time they may also have been grinding minerals. By 1860 Edmund Barnes and, later, Thomas Pimlott, were wood turning and bobbin making there. Edmund Barnes was a ‘bobbin skewer’ and general wood turner. 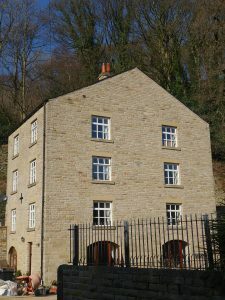 This work is known to have been carried on in the mill next door which we normally refer to today as the bobbin mill, so it is possible that the two mills were employed in this work under the same management and the two mills referred to by the same name. 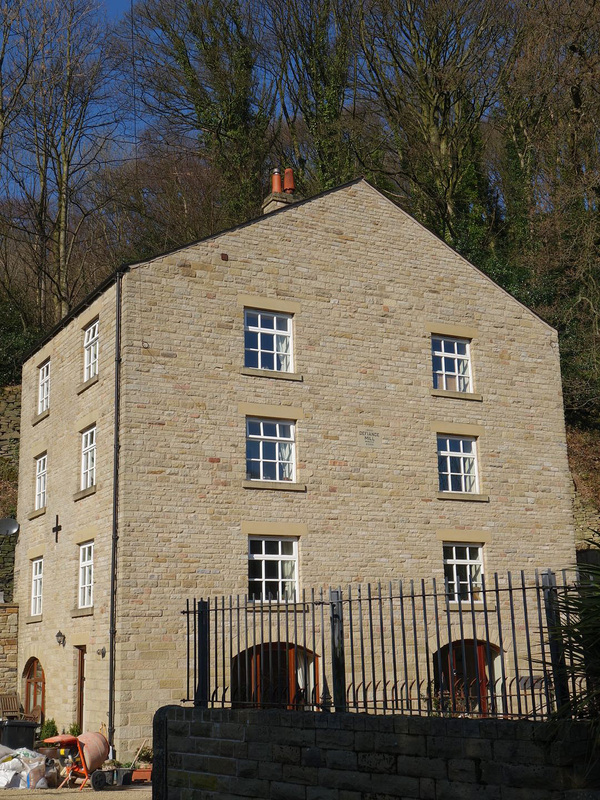 Both mills were water powered by the Harrop brook which ran under the bobbin mill. A head of water was provided by a mill pond located where Pool Bank car park is today. This pond was abandoned and filled in by about the end of the 19thC and was simply a patch of waste ground for perhaps 50 years. A traveling fair used the space in the early 20thC. See the page on mill ponds. Defiance mill is located in Queen Street, on the corner that was probably the junction with Defiance Brow (more on brows), the name then given to the uphill part of today’s Queen Street. In the late 19thC, Thomas Pimlott and Thomas Gatenby were bottling water and lemonade in the mill. See Brewers and Bottlers. “Above picture is what remained of Defiance Mill shortly before the housing development. The tall part of the mill is all that remains now. 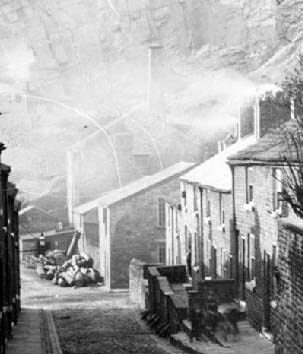 The lower section (over Harrop/Sowcar Brook) was demolished, as were the adjacent buildings along Queen Street which were part of the Oak Bank Mill site.The lower section, now demolished would once have been the same height as the remaining part of the mill, this gable end was fully rebuilt as part of the renovation, the other three walls are pretty much as they were. That gable end was much rougher stone (similar to an internal wall) whereas the other three walls were much better construction. Why or when the other half of the mill was lowered to a two storey section is not known to me.” Thank you Anthony Holland for the last paragraph. Queen Street above formerly defiance brow as it is now 2019. 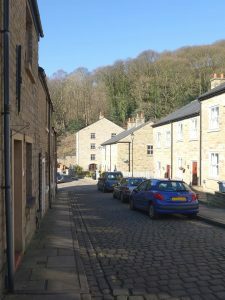 The mill above was fully refurbished in 2000 and converted for domestic accommodation. Photo 2019.